Numerous manufacturers operating in the global superhydrophobic coatings market makes it fragmented and extremely competitive. This is expected to help the market attain a double digit growth vis-à-vis both revenue and volume over the course of the forecast period from 2016 to 2024. A recent report by Transparency Market Research on the market observes that despite steep initial upfront investment new entrants are prospering in the market on the back of product innovations leveraging latest technologies. Some of the prominent participants in the global market for superhydrophobic coatings are The Sherwin-Williams Company, P2i Limited, DryWired, LLC, Cytonix, LLC, Surfactis Technologies, UltraTech International, Inc., NEI Corporation, Sto Group, Nanex Company, NTT Advanced Technology Corporation, Artekya Ltd., Lotus Leaf Coatings, Inc., Rust-Oleum Corporation, and Aculon, Inc.
Our finds that the worldwide market for superhydrophobic coatings will progress at a mind-boggling 34.3% CAGR from 2016 to 2024. Rising at this rate, by 2024-end the market is expected to clock a value of US$37.1 mn from US$2.90 mn in 2015. Volume-wise, our report estimates the market to expand at a phenomenal CAGR of 37.3% from 2016 to 2024. Some of the key end use application of superhydrophobic coatings are textile and leather, electronics and telecommunication, building and construction, medical and healthcare, automotive, and others such as power generation, optical, etc. Of them, the segment of electronics and telecommunications accounted for a substantial demand share of 32.0% in 2015. In the years ahead to the segment is expected to surge ahead because of the growing application of superhydrophobic coatings in semiconductors, consumer electronics, and other electronic components. 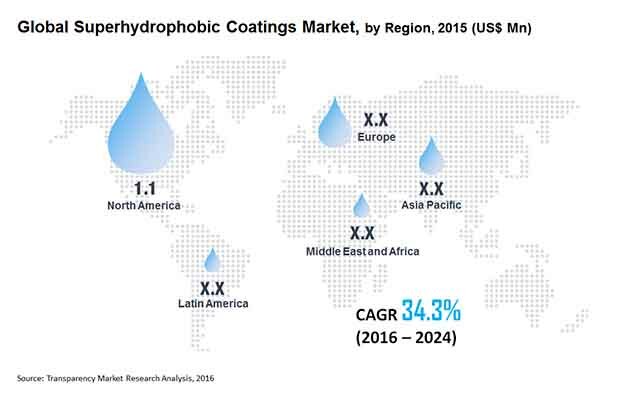 Geographically, the key regions in the global market for superhydrophobic coatings are North America, Asia Pacific, Europe, Latin America, and the Middle East and Africa. North America, of them, powered by the U.S., currently leads the market in terms of volume. A well developed electronics and telecommunication industry and the swiftly recovering construction sector in the region is fueling its market majorly. Another factor stoking stellar growth in the global market for superhydrophobic coatings is the booming construction industry which has exponentially driven up demand for composite materials. Besides, superhydrophobic coatings also provide excellent resistance to high temperature, alongside robust barriers against microbes and water. However, strict government rules with regard to coating ingredients and formulations in North America, Europe, and Asia Pacific is likely to impact the superhydrophobic coatings market negatively in the near future.